A National Framework for Advance Care Directives. September 2011. An historical, legislative and policy overview of advance care planning and advance care directives across Australia. Any professionals interested in advance care planning should be familiar with this document. The Dementia Journey: Information and Workbook for Planning Ahead. Developed by Palliative Care NSW in association with Dementia Australia NSW, and designed to help people with dementia plan ahead. Capacity Australia. This website includes mini legal kits to guide health professionals in the assessment of capacity. The kits have been individually developed for each state and territory. Capacity toolkit and website. This document provides practical information and guidance to government employees, community workers, professionals, families and carers on issues relating to capacity and capacity assessment. While developed in New South Wales, it is mostly relevant for all parts of Australia. Respect my decisions: It’s my right. This document is a guide to advance end-of-life care planning for gay, lesbian, bisexual, transgender and intersex (LGBTI) people. Planning for palliative dementia care: resource guide. A guide to palliative care planning, with a focus on supporting people to remain living at home throughout their life. It assists workers provide appropriate support, promotes consistent practice across the organisation; and promotes communication between the care team and specialist palliative care services. A plan of care and website. This resource outlines how to help people make health and personal decisions for a person who has lost capacity. It provides information about substitute decision-making and medical treatments at the end of life. While written in the context of New South Wales, much of the material is relevant in any location. Information about regulations such as guardianship and advance directives will vary between states and territories. 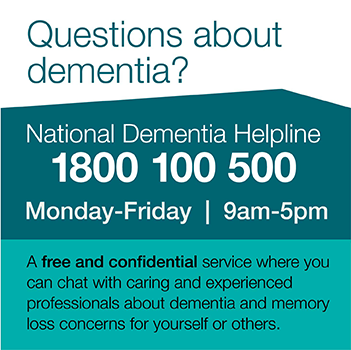 Talking about dementia and dying: a discussion tool for residential aged care facility staff. A useful, practical resource for any professionals working with people in late-stage dementia, helping staff discuss death and dying with people with dementia and their families. What prevents people with dementia making plans for their future?. A report of a research project about planning ahead that was undertaken by Dementia Australia (NSW). Integrated care framework for advanced dementia (ICF-D). This is an online resource primarily aimed at residential aged care staff, containing a suite of tools to help staff to implement a quality improvement program for a palliative approach to dementia. It contains an online assessment tool, care plans based on individual assessments to enable person-centred care, communication guides with associated family factsheets, education modules for staff and audiovisual teaching materials. There is also an inbuilt report and audit tool that allows RACFs to monitor individual residents care and overall quality improvement across the whole facility.